The environmental disaster, which originated in the Vung Ang waters, has now spread throughout Central Vietnam, with pulluted seawater, tons of dead fish and ever-present destruction of the ecosystem. The authorities have expressed confusion and non-transparency in the handling of disasters. Until now, the cause of the disaster has not yet been announced. 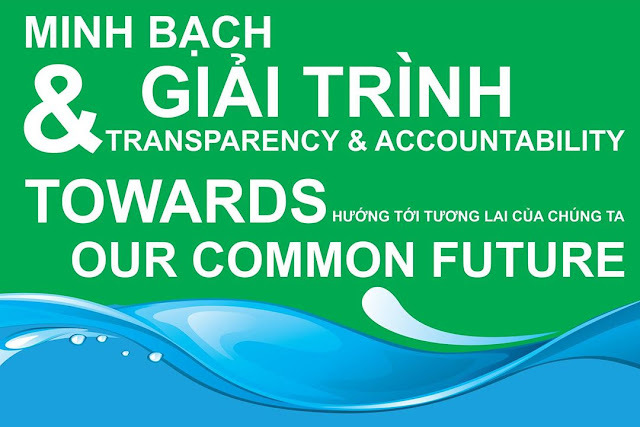 Immediately after that situation and due to heightened risk of no longer eating fish in the East Sea, thousands of people in Hanoi and Saigon conducted peaceful demonstration on May 1 and 8. The message that people want to convey to the authorities is simply: fish need clean water, people need transparency. However, in response to the peace and goodwill of the people, police, civil defense, young volunteers and many unknown forces prevented, disrupted or even brutally beaten people the people's march, not minding the women and children involved. The act of repression is particularly serious in Ho Chi Minh City, where self-proclaimed "authorities" assaulted civilians on the spot or at the police station, causing injuries and bloodshed. The more pressing contact is that environmental disasters are slowly becoming political crises. When the responsibility, the sense of community, patriotism and legitimacy are not reciprocated and are cruelly trampled, the people lose their faith in the government, the divided society, while leaving the environmental disaster still in its destructive impact. 1. Dramatically resist any act of deterrence, repression, beating or insulting of demonstrators who merely exercise their right to freedom of expression in a peaceful manner. We particularly oppose the crackdown of protesters in Saigon; Hanoi would like to share with the mental and physical pain of the people in Saigon who have been victims of recent harassment and repression. 2. Mobilization, persuasion, pressures ... We require the government to meet the needs and aspirations of the people, which are to have normal jobs in all democratic societies. Therefore, we will continue this work, in whatever form possible - from the streets to the court, to petitions, etc. We ask the authorities to clarify the cause of the environmental disaster in the Central Sea and at the same time announce that cause to the people. We also require a clear timeline and deadline; and not just state in general terms that they are "investigating and clarifying" the issue. 3. In parallel with our opposition to repression and the continuing struggle, we also urge all levels of government to immediately stop all acts, speeches, denunciations, that shot and slander the protesters. These include statements such as "reactionary forces", "strangled, incited", "take advantage of the situation to fight," "disturb public order," etc. The request to end the criminalization of the exercise of the right to freedom of expression - which is solemnly stipulated in the Vietnamese Constitution and the international human rights conventions to which Vietnam has acceded. This is our stand and declaration.